Monterey Bay National Marine Sanctuary. It is a whopping 6,094 square miles of protected, enchanting ocean off California’s coast that’s just ripe for research, tourism, and conservation. It’s called the “Serengeti of the Sea” — a thriving, marine melting pot featuring nearly 200 species of shorebirds and seabirds and over 500 species of fish, invertebrates, and algae. But the stars of this sanctuary are surely the marine mammals that pass through or reside in and near the sanctuary’s boundaries: at least thirty-six different species that include everything from whales to sea lions, porpoises to sea otters. Long fascinating humans with their complex social structures, incredible size, and even more impressive grace, whales have provided researchers with countless hours of scientific data. Without them, marine mammal behavior and migration patterns may have remained a mystery. But thanks to research like the kind conducted at Monterey Bay National Marine Sanctuary, other national marine sanctuary sites, and around the world, we have a much better understanding of these magnificent marine mammals and their mysterious ways of life. 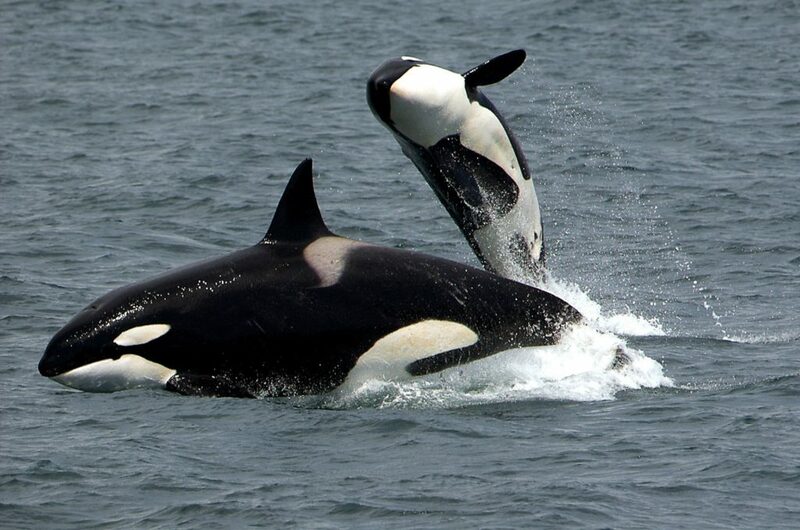 There are at least eight different species of whales and dolphins that frequent the protected waters off the shores of California’s northern coast, including the humpback whale, the blue whale, and orcas (the largest species of dolphin). All magnificent, majestic creatures, whales play vital roles in balancing marine ecosystems. Whales help regulate and maintain a balanced food chain. They help prevent over-population by eating prey such as krill, and whale poop might even reduce harmful carbons in the Earth’s atmosphere by promoting the growth of phytoplankton at the ocean’s surface. Whale-watching is a popular activity among locals and tourists alike, and supports the local economy. Seals and sea lions in Monterey Bay are thriving in the sanctuary. Various species such as elephant seals, harbor seals, and California sea lions frequent the waters and shores of Monterey Bay, safeguarded from hunting as well as from commercial over-fishing and pollution. They’re a sought-after site for tourists who enjoy observing their sometimes laughable antics from a non-threatening distance. Some species, such as the elephant seal, come ashore annually to breed and to give birth to pups and can sometimes be observed playing out these familial roles, much to the delight of passers-by. Once threatened, sea otters have managed to make an amazing comeback, thanks to protected areas as Monterey Bay National Marine Sanctuary and policies at the local, state, and national levels. Diminished in number by a variety of factors in the wild — natural predators, hunting by humans, oil spills, and disappearing habitats — sea otters in Monterey can thrive and populations are able to recover. Unlike seals and sea lions, sea otters are no longer listed on the World Wildlife Federation’s Endangered Species Directory but they are protected under the Marine Mammal Protection Act of 1972. Not every species of marine mammal observed in Monterey Bay National Marine Sanctuary lives there year-round. Some pass through seasonally on their annual migrations, come ashore to rest or to reproduce or hunt in the lush kelp forests that provide food and protection from natural predators such as sharks and orcas. Anyone interested in observing these magnificent marine mammals in their natural habitat has a prime opportunity to do so at Monterey Bay National Marine Sanctuary, so long as they respect the rules of interaction. The Marine Mammal Protection Act provides good guidance for anyone interested in going whale-watching or observing seals. The Act protects all marine mammals in U.S. waters by preventing interactions with them except for permitted scientific research or rescue. This includes approaching them too closely or infringing upon the mammal’s habitats or disturbing their migration, breeding, birth, or shelter. Our partners at NOAA’s Office of National Marine Sanctuaries also provide marine wildlife viewing guidelines that promote responsible encounters with marine wildlife and their habitats in national marine sanctuaries. The Foundation is a leading voice for U.S. protected waters, working with communities to conserve and expand those special places for a healthy ocean, coasts, and Great Lakes. Working together, we safeguard species and the places they call home and preserve America’s maritime resources.